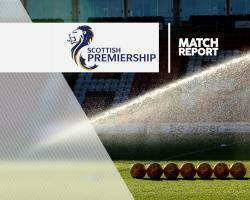 Louis Moult continued to haunt Hamilton as the striker's looping header sent Motherwell three points above Accies after a tense relegation battle at the SuperSeal Stadium. Moult's sixth Lanarkshire derby goal of the season midway through the second half secured a 1-0 victory which moved Motherwell out of the play-off place and made them safe from the automatic drop with two games remaining. There was little between the teams in a game which had 10 bookings but Moult once again proved the difference with his 18th goal of the season. Hamilton had Grant Gillespie, Danny Redmond and Ali Crawford back in their team and they all added a touch of guile to what was an understandably functional first half where the ball was often flying above the wet, artificial surface. Motherwell recalled Craig Clay and the midfielder had the visitors' best two efforts of the opening half, shooting just wide following a Moult lay-off before volleying just past from 20 yards following a counter-attack. Crawford missed Hamilton's best first-half chance, shooting well over from 15 yards in the centre of the penalty box after good play from Gillespie and Redmond, who later sent a looping shot just over the bar. Carl McHugh and Allan Campbell followed into the book for fairly innocuous fouls. Dougie Imrie had a decent volley saved after Crawford's diagonal ball and the 2,300 away fans might have feared it was not going to be their day when it was announced that all trains to Motherwell had been cancelled because of flooding - they were later told there would be no replacement buses. His opposite number, Remi Matthews, was booked for throwing the ball away to stop Motherwell taking a quick throw in a dangerous situation and Motherwell manager Stephen Robinson threw on winger Lionel Ainsworth for Lasley in the 66th minute. Moult rose well to meet Elliott Frear's free-kick and the ball looped into the top corner as Matthews looked on helplessly. Greg Docherty and Darian MacKinnon became the latest players booked for crudely halting Motherwell breaks. Motherwell managed to keep Hamilton away from their goal until the closing stages when Hamilton substitute David Templeton came close to a debut goal with a deflected strike before he too was booked for a crude challenge. Ainsworth came close in four minutes of injury-time before the final whistle was met with jubilation in the packed visiting end and quiet dejection in the home stand.